More and more lately, I’ve been getting asked this question: How did I come up with Cork O’Connor as the protagonist for my series? So here’s the answer. Long before I began to think about writing a mystery, a character began to take shape in my imagination. The first thing I knew about him was that he was going to be the kind of guy who was so resilient that no matter how far down life pushed him, he would always bob back to the surface. His name would be Cork. Because I was about forty then and going through the first of a couple of midlife crises, I imagined him confused about life, maybe in some kind of meltdown, struggling, pushed about as far down as he’d ever been. I saw him as having a family (probably because I had a family and it was easy to imagine). I saw him as a guy ordinary-looking as sidewalk concrete, and not very macho. But I also thought he would be the kind of guy you knew instinctively that you could trust, that if you asked something of him and he gave his word, he would walk through hell barefooted, if necessary, to keep his promise. He wouldn’t be brilliant, but he would be dogged. When I began to think about the story that eventually became my first published novel, Iron Lake, and made the decision to set the tale in the great Northwoods, I realized I couldn’t write about that part of Minnesota without somehow dealing with the Ojibwe, whose influence there is ubiquitous. To digress just a moment, when writers of fiction are thinking of a story, any story, what we look for is conflict. Conflict drives great stories. And when I looked at the north country of Minnesota, all I saw was conflict. In the harsh, beautiful landscape. In the weather. In the struggle of different cultures to live together. I realized that if I created a character of mixed heritage in this setting, a man who had a foot in two different cultures, white and Ojibwe, I could mirror the conflict of those cultures in all his thinking and his being. Conflict would be a natural part of who he was. Then I began to consider the issue of what would that mix of heritage be. Ojibwe-Swedish? Ojibwe-Finn? Ojibwe-French? Ojibwe-Italian? Ojibwe-Slovakian? All these combinations do, in fact, exist up north where a world of differing ethnic groups migrated because of the logging and the iron mining. I finally settled on Ojibwe-Irish. Cork became Corcoran (quite naturally), and I added O’Connor. Cork isn’t me, but the way he sees the world and what’s important to him come very much out of who I am. He believes in family. He believes in justice. He believes you make commitments and stand by them. He’s become a wonderfully complex character over the course of ten books, and I’m still learning about him. I’m thinking that even if I write twenty books, he’ll still be able to surprise me. 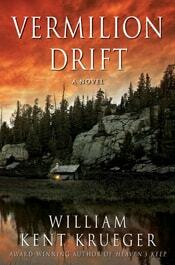 Vermilion Drift, the 10th in the Cork O’Connor series, goes on sale in bookstores everywhere tomorrow. This is a book that has surprised the hell out of me. I don’t know about most authors, but me, I’m almost never a good judge of the quality of what I’ve written. Except for one or two rare exceptions, by the time I’m finished with a manuscript—all seven or eight revisions—and my editor and I are in agreement that the work is ready for production, I’m usually sick to death of it. The story is lackluster, the writing pedestrian, the twists all telegraphed well beforehand. Everything about the project feels flat. I want nothing more to do with it, and am so ready to move on to the next story, which I’m always certain is bound to be better than the piece of dreck I’ve wasted the last year writing. Vermilion Drift was no exception. I remember thinking at the end of the process that eventually every author has to turn out a piece that falls short, and I figured this was the piece for me. There were good elements in it, to be sure—the remarkable Iron Range setting, the deliciously dark secrets from the past of Cork O’Connor, the wonderful role Henry Meloux played. But overall, I thought I’d come up shy. All I could see were the weaknesses, the words that didn’t quite say what I’d hoped they would, the obvious manipulations, the floppy motivations, the potential for disaster. Then I saw the finished book. Oh, is it lovely. One of my favorite covers. And then the reviews started rolling in. Starred reviews from both Publishers Weekly and Kirkus. Kirkus, for god’s sake! They never like my stuff. Last week, I got word that the book will be reviewed in The New York Times Book Review, and is being considered as a People magazine book pick. We even got a call from Hollywood. So now I’m stoked. What’s changed? Nothing, really, except I’ve been able to step back from the work and look at it through different eyes. With a little distance—and with the encouragement that comes from a good critical response—it’s easier to see the strengths of the story instead of focusing all that I know falls short. No work is perfect, but at the outset we always believe somehow we can make it so. In the end—to maintain sanity—an author needs to learn to come to terms with the great potential and the ultimate reality. Kind of like loving someone even though there are things about them that drive you nuts.